The City of Wanneroo has again hosted the largest citizenship ceremony in the country, with 785 people from 63 different countries making the pledge to become Australian citizens on our national day. The Wanneroo Showgrounds was filled with colour and excitement as the new citizens and their 2000 guests enjoyed a day of national pride and celebration. Mayor Tracey Roberts said this was the sixth year running that the City of Wanneroo has hosted the largest ceremony in the nation on Australia Day. 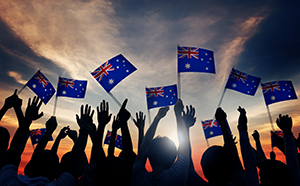 This year marks the 70th anniversary since Australian citizenship was introduced into law, creating for the first time a legal status of being uniquely Australian. New citizens and their guests started the day with a traditional barbeque breakfast, followed by the official ceremony. Adrian Barich was master of ceremonies, Rishelle Hume AM, 2016 Aboriginal Person of the Year, was the inspirational guest speaker, Richard Walley OAM performed the Welcome to Country and crowds were entertained with performances by Challenge Brass Band and Perth singer Bindhu. Mayor Tracey Roberts presented the City of Wanneroo Australia Day Awards to local community members who have made an outstanding contribution to the community (see below for full details). “It really is an incredible day, to see so many people from so many different backgrounds enjoying the celebrations on such a special occasion,” Mayor Roberts said. An active member of our community, displaying outstanding community spirit not only as a student at Butler College, but through volunteer roles with multiple emergency services organisations. In 2017 he received the Edith Cowan University Citizenship Award in recognition of his dedication to our community. Benn has been a volunteer surf life saver with Quinns Mindarie Surf Life Saving Club for the past five years, helping to ensure the safety of beachgoers and an active member of Quinns Rocks Bush Fire Brigade for the past four years. Consistently goes above and beyond for our community, making herself available for coaching, consultation and mentoring to anyone in need. She is a staunch advocate for young people, using her network to help facilitate mentoring and work experience opportunities for young people looking to pursue a professional career. Dr Nyaga is a board member of the Kenyan Community in Western Australia and Vice President of the Organisation of African Communities, where she is actively involved in the ‘Stop the Violence’ program, an OAC initiative sponsored by the Office for Multicultural Interests. A strong supporter of women in business and entrepreneurship, she was nominated for the International Women’s Day Hall of Fame in 2014. The Lake Joondalup 3 Plus Program provides specialist care for additional needs children in our community. They have recently opened Perth’s first sensory room and have partnered with Wanneroo Community Garden to create a sensory garden to aid the learning and development of the children and families who access their services. An active member and President of Brighton Community Garden and Education Centre since its foundation in 2011, Mr Terry’s wealth of knowledge and experience is readily shared with Garden members and the community, educating and advising people on the establishment and care of their plots within the community garden. He regularly assists university students with information for assignments and works closely with staff and students from East Butler Primary School educating them on correct gardening techniques. Additionally, Mr Terry has organised and run numerous community workshops on sustainable gardening; and his work educating the community on the important relationship between community gardens and healthy food has been recognised and championed by the Planning Institute of Australia and the Heart Foundation.